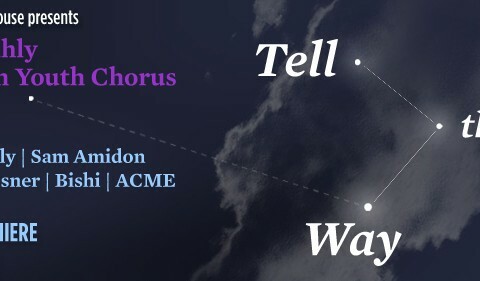 Tell The Way is a newly commissioned collaborative work created for the Brooklyn Youth Chorus (Dianne Berkun, Artistic Director) by the ubiquitous Nico Muhly. Loosely based on medieval and colonial English travel narratives, the work draws from American folk sources, prayers for the Royal Navy, early colonial diaries, Mandeville, Herodotus and Marco Polo. Nico Muhly’s music is propulsive travel-music, but at the heart of Tell The Way are three meditative collaborations between Muhly and Bishi, Muhly and Bryce Dessner and Muhly and Sam Amidon. The American Contemporary Music Ensemble (ACME) augments the voices of the Brooklyn Youth Chorus, Bryce’s guitar, Sam’s banjo and fiddle, and Bishi’s sitar. The Brooklyn Youth Chorus is…a polished ensemble of miniature professionals.